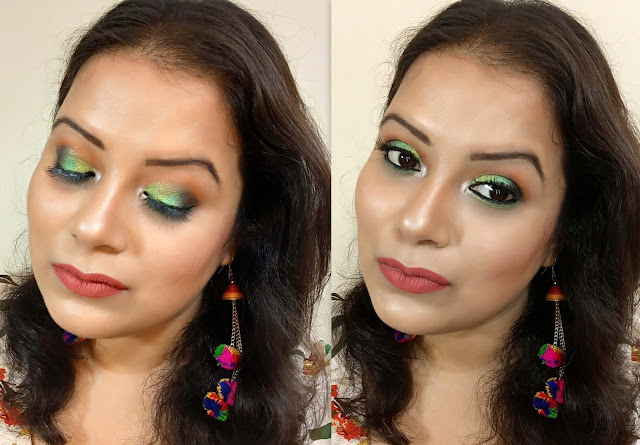 Today I am up with another makeup tutorial which is just perfect for this upcoming Karva Chauth or in this festive season. I have got loads of appreciation for this look so I decided to recreate this look once again for you all. INGLOT REFILL EYE SHADOW IN SHADE 63. SUGAR COSMETICS TWIST AND SHOUTOUT KAJAL IN 01 SHADE. MAYBELLINE AGE REWIND CONCEALER IN MEDIUM. THE BALM MANIZER SISTER PALETTE. MAKEUP GEEK REFILL EYE SHADOW STARRY EYED. L'OREAL VOLUME MILLION LASHES MASCARA. LIPSTICK: SUGAR COSMETICS SHADE NO.13.